1.5years warranty, if any quality problems of the liquid nitrogen container, we change you for a new one! 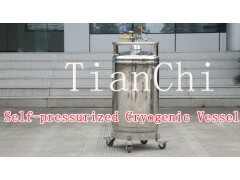 2.Overseas service and guidance is feasible to solve the trouble for liquid nitrogen container. 4.Any questions after sale are welcome and we will try our best to solve your problems. self-pressurized tank is a new technology products, in recent years the introduction of our company for storage, transportation of liquefied air products (liquid nitrogen) of high vacuum multilayer insulation movable cryogenic liquid container. The complex structure, made of stainless steel inner liner, high vacuum insulation interlayer, built-in type gasifier, valves and piping and safety system etc. *YDZ series are equipped with double safety auto-control valves and double protective measure, which are more safe to use. *This kind of products have the feature of increasing pressure and draining the liquid continuously, which helps to effectively fill the liquid . *The movable wheels with high carrying capacitymake it easily move. *The special ultra-low temperature cut-off valves are easier to operate.They are durable and elegant. *Widely used supplementary and transportation of liquid nitrogen,liquid oxygen,and liquid argon containers*Together with the devices of laboratory and electronic instruments.